The MicroStationAPI provides an API for developers wanting to create custom applications for MicroStation® from Bentley Systems. We usually create a MicroStation application as a DLL, written using C++ and built with the Microsoft C++ compiler and linker. You can choose whether to use Microsoft Visual Studio or the Bentley Systems make (bmake) tools. This example uses the MicroStationAPI and Boost.Geometry in a C++ project. The project is built using Bentley make (bmake). While it uses the C++ compiler and linker provided by Visual Studio, it doesn't use Visual Studio itself. What is a Concave Hull? In MicroStation terms, we want to start with a set of points. 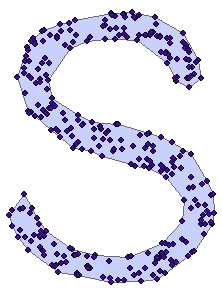 MicroStation points might be obtained, for example, from point cells, text elements, shared cells or zero length lines. 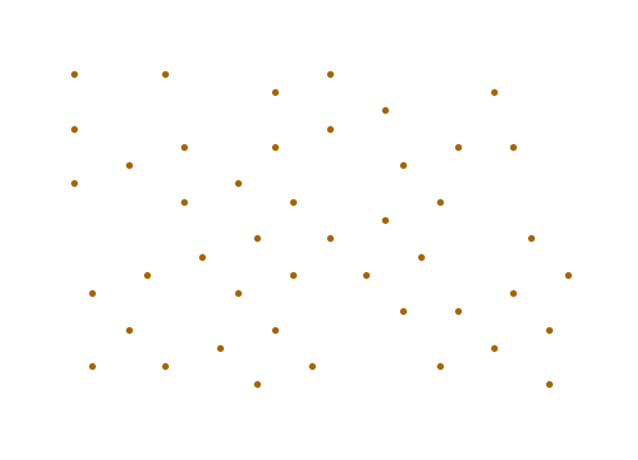 Then we want to create a shape element (2D) that encloses that set of points. We want to provide a tool that enables a user to select the points, text elements or shape element using the MicroStation idioms of fence, selection set or user pick operation. 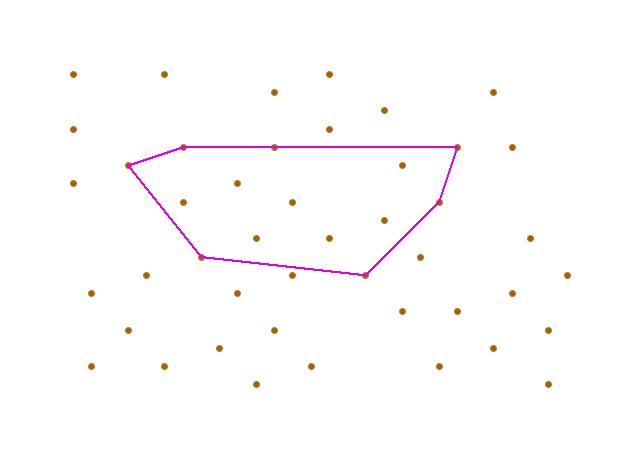 After selecting the points, the user instructs the tool to calculate the convex hull. We convert that result to a MicroStation shape element and add it to the DGN model. The MicroStationAPI is a C++ class library. Its base class for implementing the user selection idioms is DgnElementSetTool. It provides a framework for fence, selection set and user pick operations, which is exactly what we want. In this example, our PickPointsTool, PickTextTool and PickShapeTool classes inherit from DgnElementSetTool. 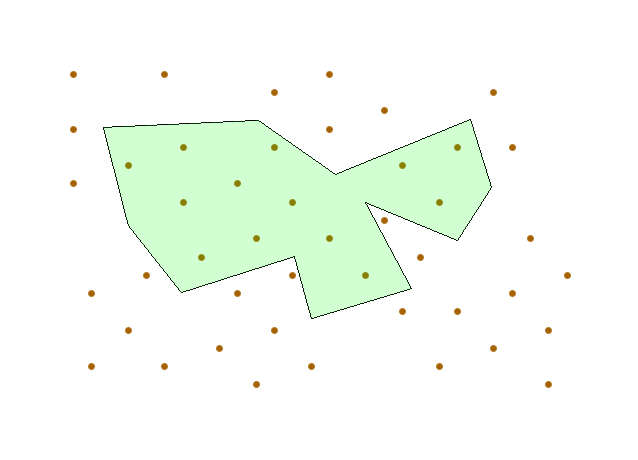 Whichever selection method the user chooses, the result is a collection of data points (std::vector<DPoint3d>). The question that this example answers was posted on the Be Communities MicroStation Programming Forum. The questioner asked for an algorithm (or magic wand) that would answer his question. I was unaware that a solution existed, until a Bentley Systems staffer mentioned the MicroStationAPI Computational Geometry API, supplied in header file mscompge.fdf (MicroStation Computational Geometry), which you will find in folder ../SDK/include/Mstn/MdlApi. That header file provides a number of functions that appear fascinating. If only they were documented! The one that interests us here is mdlCompGeom_convexHull2d. You'll notice the 2d suffix. As with most of the functions declared in that header, that 2d suffix indicates that the algorithm works with planar 2D arrays of points, lines, polygons or whatever. That is, the algorithm won't work with non-planar sets of objects in 3D. MDL is a C library, so mdlCompGeom_convexHull2d function is also a C function. 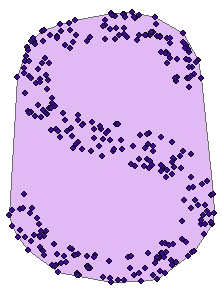 It works in a typical C-style, taking a C-style array of DPoint3d and storing its result in another array of DPoint3d. The developer is responsible for memory allocation and deallocation of dynamic arrays. Boost.Geometry is a template library, as is most of Boost. It's supplied in source-code header (*.hpp) files; there are no binary library files. All you need to do is #include the appropriate headers, and the C++ compiler does the rest. Including the appropriate headers is the problem: what are the right headers? We've figured that out for you, and the #includes in our source code demonstrate what you need to know. Possibly the trickiest part, at least if you are lost in the somewhat terse but voluminous documentation of Boost.Geometry, is how to use MDL's DPoint3d with the Boost.Geometry library. We've also figured out how to do that (termed as registering the point with Boost.Geometry). The registration technique is described elsewhere on this web site. Download the Convex Hull Source Code. Unpack the ZIP file, retaining the folder structure. The pack includes a Bentley make (bmake) file. Return to MicroStationAPI articles index.